Akwid performing in California in 2004. Sergio and Francisco Gómez were born in Jiquilpan, Michoacán, Mexico. Relocated to the United States of America at the ages of five and three years. They are not twins, Sergio is older. They grew up a mile West from Down Town LA in an area now known as Westlake South. Sergio Gomez and his siblings attended 10th St Elementary and Berendo Junior High. Educated later on the streets of South Central Los Angeles, they discovered a musical talent and a great concern among the worlds of Hip Hop. They were recognized and aggressively pressed the fusion of music and culture. Akwid gave life and the identity of people who today represents youth between communities worldwide. Appointed pioneers of the genre, humbly Gómez brothers are in the world of creation and expression through music. Conquering one to see with a unique style to others. Their first album, Proyecto Akwid, won two Billboard Prizes and a Latin Grammy Award for Best Latin Rock/Alternative Album. 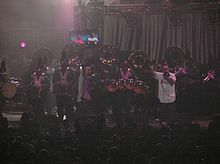 Their 2004 album Hoy, Ayer, and Forever remixes several songs from the album 2002 A.D. using their more recent style, incorporating regional Mexican music. Their 2004 album KOMP 104.9 Radio Compa is in the form of a broadcast on a fictitious radio station that plays only Akwid, and their 2005 album Los Aguacates De Jiquilpan is in the form of a fairy tale explaining their arrival from Mexico to the U.S.. They are currently signed to Universal's Machete Music. Their song, "¡Chivas Explosivas!" is the official anthem for Club Deportivo Chivas USA of Major League Soccer. ^ Loftus, Johnny (2004). "Akwid > Biography". allmusic. Retrieved 2008-12-21. ^ "Akwid". Akwid. Retrieved 2017-06-29. ^ Kun, Josh. "What Is an MC If He Can't Rap to Banda? Making Music in Nuevo L.A." American Quarterly56, no. 3 (2004): 741-58. This page was last edited on 10 April 2019, at 22:35 (UTC).